Rebecca is great!! I got a pedicure done two weeks ago and it still looks great. I also got my first laser treatment session with her and she's funny and nice. She made me feel comfortable the whole time! I'll definitely be back for more services! Really loved their service and their treatment of employees is fantastic. Did a great job on the pedi with lots of time for feedback at every step. Enjoyed my experience. Nails looked great, they lasted decently. Would definitely return. Amazing! Helen was very detailed and careful. Love my nails and an excellent way to spend my Sunday afternoon. Highly recommend! Pre-vacation pampering by Samantha Miller again today and love, love everything she does. She is so thorough, such a perfectionist that I know when she’s satisfied, I will be for sure. Crazy meticulous! Pedicures, super cute nail art, waxing. Highly, highly recommend her! Amazing place. I used to come here for bikini wax until then they started offering brazilian laser....with cooling tip. HIGHLY RECOMMEND. Book with Rebecca. Now I have never heard of this technology until then but I gave it a try. I had a bad experience with another laser place where they overcharged me and locked me in for five sessions. So the fact that Ten Spot is pay per session is really attractive. I have very low tolerance for pain so I got myself the numbing cream. The session takes no more than 35 minutes and though the sensation is unpleasant for me, it goes away within 20 minutes of the treatment. You have to return each month so it might feel like a lot of financial commitment, but it is worth it. I wish I'd have done all my laser treatment here!! My sister and I went here yesterday. She got a facial and I got a gel manicure. The place is very clean and basic, and everyone was very nice. Parking is difficult in the area. The manicure I got is one of the best ones I've ever received, lasted a long time, and the people working there are so nice. Great service. I had never had a pediure before. I am very pleased with the attwntion to detsil. Like moat men, I have probably neglected my feet. Kellina did my pedicure and i must say she really worked hard and it was well worth the prixe. I will be back. 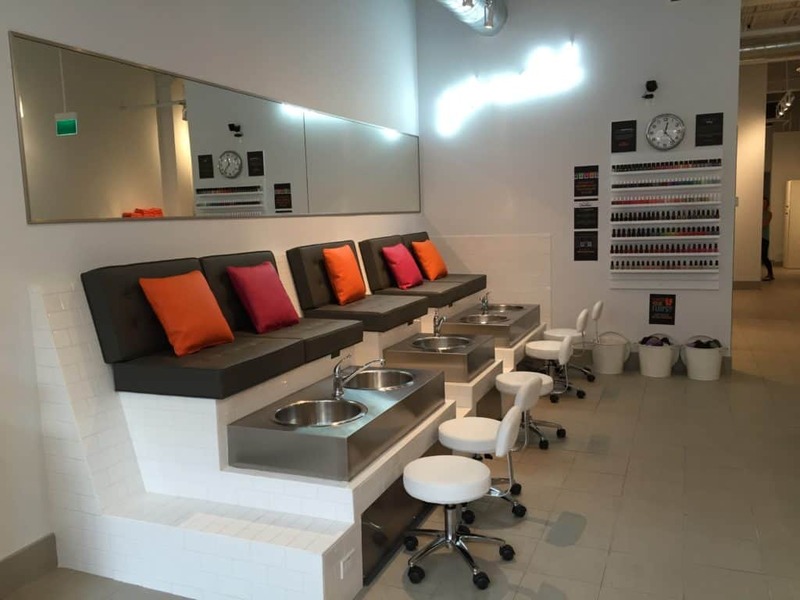 I first encountered this place when my partner booked and appointment for both of us to get pedicures (he even hit his toes painted too!) The staff are extremely friendly, easy going and splendid to talk with. Everything is extremely hygienic and they even give you tea/coffee as younger pampered (although I wish their tea cups/selection was bigger but this ain't a coffee shop and I can't have everything!) I came again with my mom a year later and everything is still as fantastic as it was then. My mom has had a few bad experiences at multiple different nail places, but she absolutely loved it here. 10/10 would go again. I came here to get the quickie mani and ped and had the pleasure of working with Kellina. Overall, it was a wonderful experience.The atmosphere:Simple layout with big windows, allowing natural light in. I can see how even better this salon would be when the sun is shining in.Cleanliness:Incredibly hygienic. I often to question how sanitary nail salons can be. Here, they have disposable nail filers and basins that are disinfected (one of the staff members disinfected the basin my feet was soaking in right after my pedi was done). Quality of service:Kellina had to work with streaky polish. After putting a second coat on my right hand, she offered to use another brand. I was happy that she would be willing to do it all over again (but my mani turned out beautiful). There are nail salons coming out of the ying yang in this city, but what I loved most about The Ten Spot was how friendly the staff were. It is easy to give mediocre customer service, but the nail technicians here care about you and their job. Well done, ladies. Keep on crushing it. This was my first time here after seeing a local blogger feature it. The staff is prompt and friendly. That is something that is really important to me when your getting a service done whether it be hair or nails. Everything from reception to the tech matters. Was greeted politely and asked if I wanted water or tea (which again is a factor I consider when I want to return). The nail tech herself was hilarious and a delight, I like when they engage with the customers as I like going to 1-2 regular techs. She did a fantastic job and went above and beyond. She matched the precise colour I wanted after I showed her a picture (not everyone accommodates this!). She listened when I told her what length and shape I wanted. The only reason this lost a star is because it’s a bit higher priced than I normally pay for a gel polish change and removal, but I honestly think I will make this one of my regular places because of how fantastic the service was today.